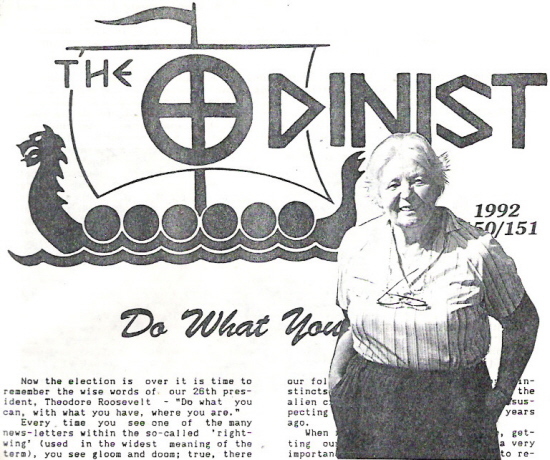 Else Christensen (1913–2005) was a Danish Odinist who established the Odinist Fellowship in the United States, where she lived for much of her life. A Third Positionist ideologue, she espoused the establishment of an anarcho-syndicalist society composed of racially Aryan communities. Born Else Ochsner in Esbjerg, Denmark, Christensen developed her anarcho-syndicalist sympathies while living in Copenhagen. From this position she moved toward the Strasserite National Bolshevik faction of the National Socialist Workers' Party of Denmark, which brought together a far right emphasis on race with a left-wing approach to economics. In 1937 she married fellow Danish Nazi activist Aage Alex Christensen, however because of their National Bolshevik allegiances they were placed under heavy scrutiny amidst the German occupation of Denmark during World War II. After the war they moved to England and then Canada, settling inToronto in 1951. Corresponding with various far right activists, she came upon the writings of the American far right ideologueFrancis Parker Yockey and the Australian Odinist Alexander Rud Mills, both of whom had a profound influence on her. Christensen subscribed to the anti-semitic conspiracy theory that Jews control the Western socio-political establishment, and believed that this would prevent the growth of any explicitly political movement to spread racial consciousness among those she deemed to be Aryan. Instead, she believed that Odinism – a variant of the Neo-Pagan religion of Heathenry – represented the best way of spreading this racial consciousness. In 1969, Else and her husband founded a group called The Odinist Fellowship. Alex died in 1971, and Else continued her work, relocating to the United States. Else published a newsletter called The Odinist for many years. In 1993 she was imprisoned for drug smuggling, although maintained that she had been used as a drug mule without her knowledge. On release, she was deported to Canada, where she lived in Vancouver Island during her final years. Christensen exerted a significant influence over the racially oriented Odinist movement, gaining the moniker of the "Grand Mother" within that community. Her life and activities have been discussed in a number of academic studies of Odinism and the far right in North America by scholars like Nicholas Goodrick-Clarke, Mattias Gardell, and Jeffrey Kaplan.